Each stamp is deeply etched onto pink rubber, mounted to EZMount Static Cling Cushion and hand cut close to each image so it is ready to use with an acrylic block right out of the package! The stamp is then packaged onto our indexed, binder-ready storage panels which fit perfectly into our EZMount Clear Enclosed Mini Binder Item #SS20! Suitable for use with many different coloring mediums, you can create amazing effects and color with Spectrum Noir Sparkle Markers, Spectrum Noir Makers, Spectrum Noir Blendable Pencils or Spectrum Aqua Markers. 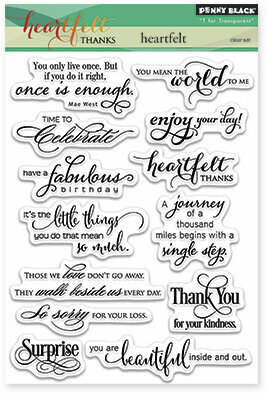 Approximate Rubber Stamp Size: 5 1/2" x 8 1/4". 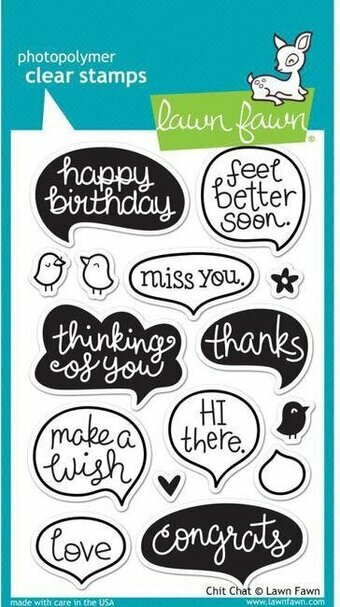 Clear stamps from Uniquely Creative featuring an assortment of birds, "Hello", "Thank You", "Happy Bird-day", and "Friend". 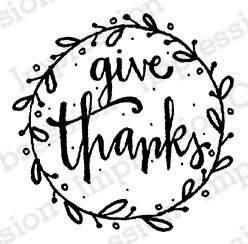 Cling Stamp from Impression Obsession featuring the sentiment "Grateful For You". Words, flags, and labels combine to make a very useful woodblock set. 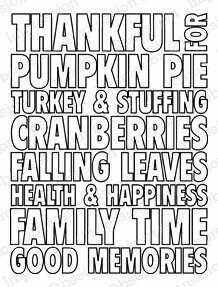 Includes "Happy Thoughts", "Who Knew", and "I'm So Thankful". Woodblock stamps are the ideal tool to express what is you: the pieces and poetry of your everyday life. These Hero Arts wood sets are made with American maple from sustainably-managed forests, use all natural rubber, and are cut and assembled by hand in the USA. A 4"x6" set of clear stamps, made of the highest quality, non-yellowing polymer. Our clear stamps are proudly made in the USA. 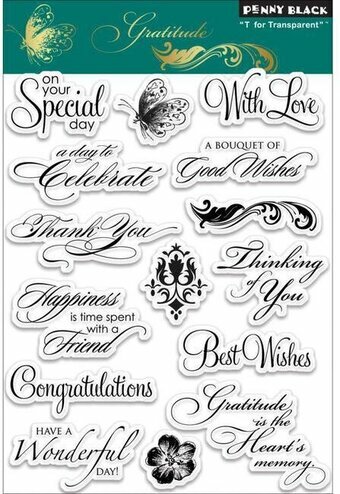 This set includes 9 clear stamps (including 7 ways to say thank you, a versatile accent doodle, and a rounded rectangle frame which fits all the stamps in the set). 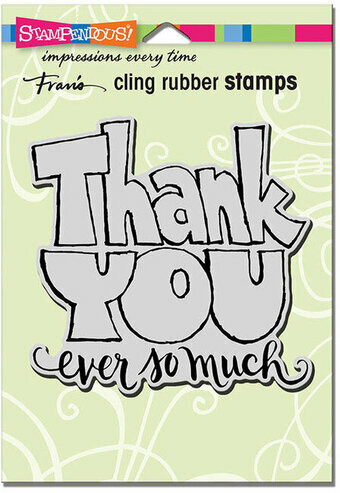 Use this clear stamp set alone, or combine with the Frantic Stamper Precision Die set: "Thanks Label" (FRA9533). The die will cut the stamp frame perfectly leaving a slight white border. Our Take A Peek stamp set will be a favorite in your collection. Stamp the sentiments/greetings and create a personalized gift tag, card, invitation, and more! 9 total stamps. Take a peek sentiment measures: 1 13/16" x 7/16"; "for you" greeting measures: 1" x 11/16"; bow measures: 2 7/16" x 1 1/2". Our Exclusive clear stamps are proudly made in the USA. 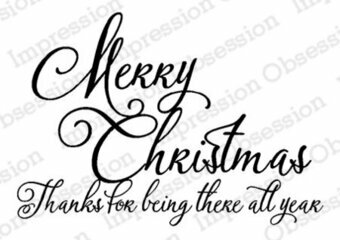 Cling Stamp from Impression Obsession featuring the sentiment "Thank God For You". 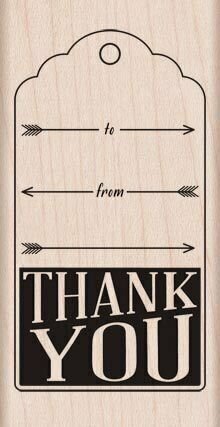 Cling Stamp from Impression Obsession featuring the sentiment "thank you". 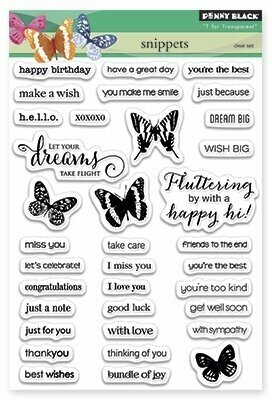 Clear stamps featuring the sentiments "Just Because", "Just Saying Hello", "Thanks A Bunch", "Good Times", and "So Very Awesome". Hero Arts clear design stamps peel off their backing and stick to acrylic blocks for easy positioning. Mix and match the designs, then easily store them for another time. Made by us in the USA from genuine photopolymer. Unmatched quality means a crisp impression every time. Beautiful EZMount rubber stamp set. Create enchanting craft projects with this fantastic stamp. This stamp contains 1 individual image & 6 individual sentiments. Each stamp is deeply etched onto pink rubber, mounted to EZMount Static Cling Cushion and hand cut close to each image so it is ready to use with an acrylic block right out of the package! The stamp is then packaged onto our indexed, binder-ready storage panels which fit perfectly into our EZMount Clear Enclosed Mini Binder Item #SS20! Suitable for use with many different coloring mediums, you can create amazing effects and color with Spectrum Noir Sparkle Markers, Spectrum Noir Makers, Spectrum Noir Blendable Pencils or Spectrum Aqua Markers. Largest Stamp Size 4.5" x 3.7" (7 pc). 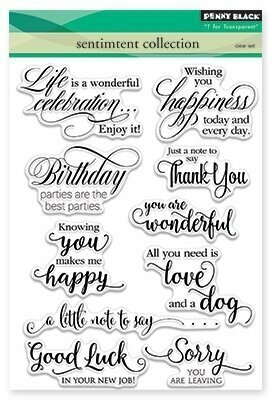 Dog themed clear stamps featuring the sentiments "Loyal Friend", "Thank you so much", "Hello Beautiful", and "You're a class act". Hero Arts 4"x6" clear stamp sets offer the best quality in the market. They are made in the USA from genuine photopolymer, which is non-toxic, biodegradable, and designed specifically to transfer ink to paper for a true impression every time. Peel off your stamp from its backing and stick to an acrylic block for easy positioning. Mix and match the designs, then clean with water or stamp cleaner. Remind a loved one how much you appreciate them with this endearing Dovecraft clear stamp collection. Featuring two sentiments, 'Thank you so much' and 'Thanks', this pack will help you leave a lovely message on your handmade project. Made in the UK using quality Photopolymer gel for a crisper image print. Penny Black clear stamps featuring Autumn leaves, "Thanks", "Overwhelmed by your kindness", and "Grateful for you". A clear set packed with fun phrases and icons, ideal for personalizing your planner, journal or calendar. Our clear design stamps peel off their backing and stick to acrylic blocks for easy positioning. Mix and match the designs, then easily store them for another time. Made by us in the USA from genuine photopolymer. Unmatched quality means a crisp impression every time. Say Thank You in a really big way with this fun to color or doodle image. Image measures approximately 3-3/4" X 3-3/4".This original design by Fran Seiford is deeply etched and precision cut from premium gray rubber on a 1/8" gray rubber foam backing then mounted on a cling vinyl decal with full sized image for easier storage and use with an acrylic handle sold separately. Made in the USA.